We were impressed with the externals and features so far, but the inside really blew us away. Firstly it looks great, with a black and orange colour scheme being the first thing you notice. Thankfully, orange isn't the dominant colour, but where it does appear it adds a nice contrast to the otherwise black murky interior. 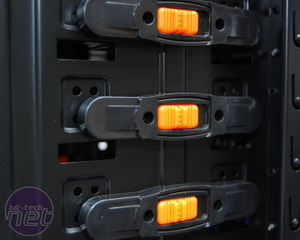 There's a total of nine 5.25in bays (the same as the Antec Nine Hundred Two) and each has a pair of orange tool-less push-button clips which work well and secure or release your optical drive in a matter of seconds. 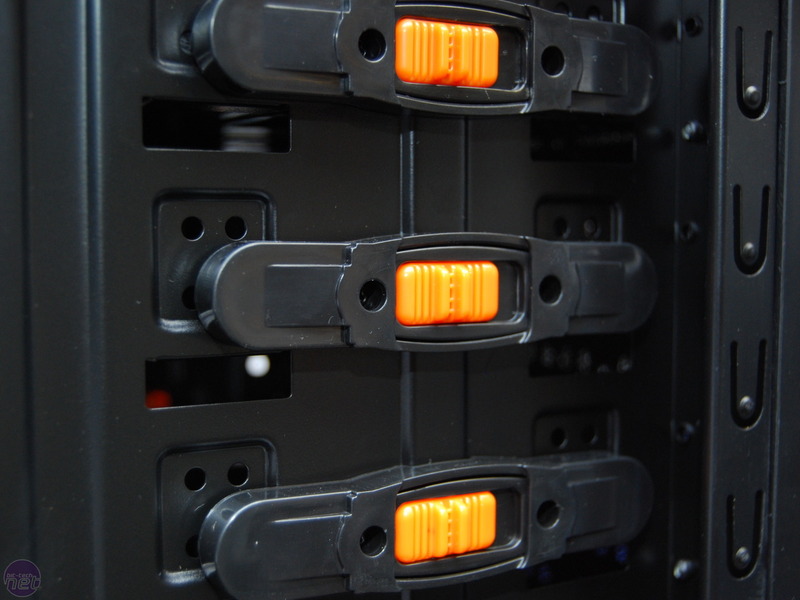 There's also a hard disk caddy which can hold up to four hard disks. This has a single 120mm fan attached, which is the only intake fan provided with the Utgard, and the only one which can be installed at the front. This single 120mm would clearly be hindered with the addition of more hard disks in the caddy. 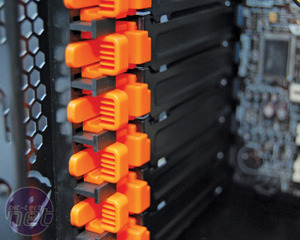 Unlike cases such as the Cooler Master Stacker series, where additional modules could be purchased, unless you fork out for some kind of 3.5in hard drive cage with a fan, the Utgard is most suited to use with one or two hard disks, despite having nine 5.25in drive bays. We're still mystified why most cases favour 5.25in bays over 3.5in when one optical drive is sufficient and even bay reservoirs will only use a couple of slots at most. 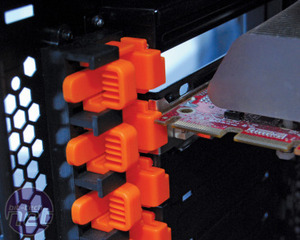 With the hard disk caddy positioned directly behind the top 16x PCI-E slot of your motherboard, you'll be limiting the length of graphics card you can install. A 9in long ATI Radeon HD 5850 was a tight squeeze, use anything longer and you'll need to move the drive module (and its fan) down into the lower-most 5.25in bays. 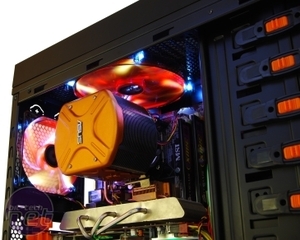 This will impact on the amount of air flowing toward your graphics card and CPU cooler. Remember though that the side panel allows for two additional intake fans, and there's a tool-less 140mm fan mount in the floor in front of the PSU mount. However, we'd have liked a way to add another front intake fan. With these niggles out of the way, we come to what some of us here at bit-tech consider a miracle of the case world. 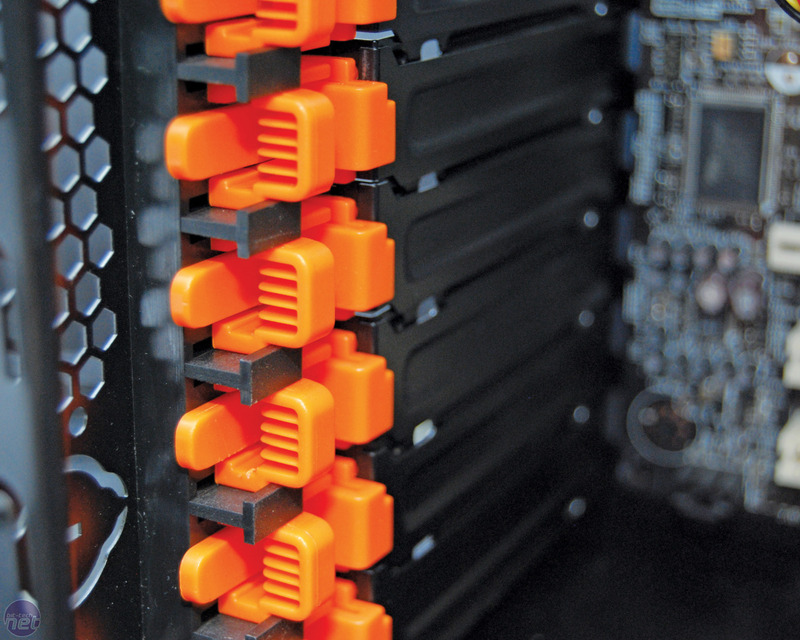 The Utgard comes with tool-less expansion slot fittings. Usually these blighters fail in spectacular fashion, and only a few companies (Lian Li springs to mind, but there are others) have succeeded in making clips that work without the need for a screwdriver. The Utgard's toll-less fittings, while a little fiddly, worked brilliantly with our ATI Radeon HD 3850 graphics card, and to make sure this wasn't a fluke, we installed an HD 5850 to double-check. While the clips needed a bit more force, they still managed to clip in place without us needing to resort to the tool kit, and they held the card as firmly as any screw could. Moving to the top of the case, we've already mentioned that there's a large removable mesh cage above the 170mm roof fan. This reveals a large hole which will be interesting to those who are wandering if the Utgard has any water-cooling potential. 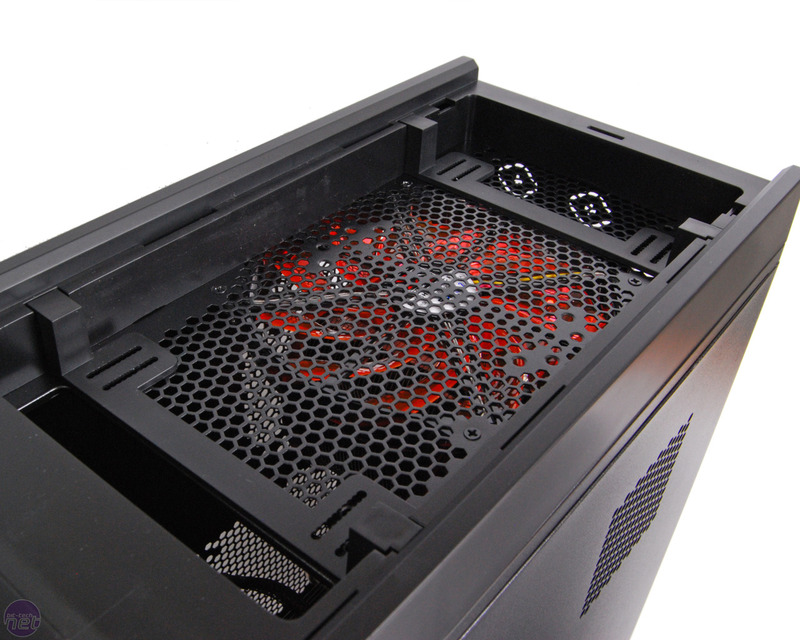 The 170mm fan is removable and there are mounts for two 120mm or 140mm fans, and likewise room for dual 120mm or even dual 140mm radiators. The hole measures approximately 318mm x 160mm x 46mm, so won't accommodate radiators such as the XSPC RX series which are well over 50mm deep, but many radiators will fit. 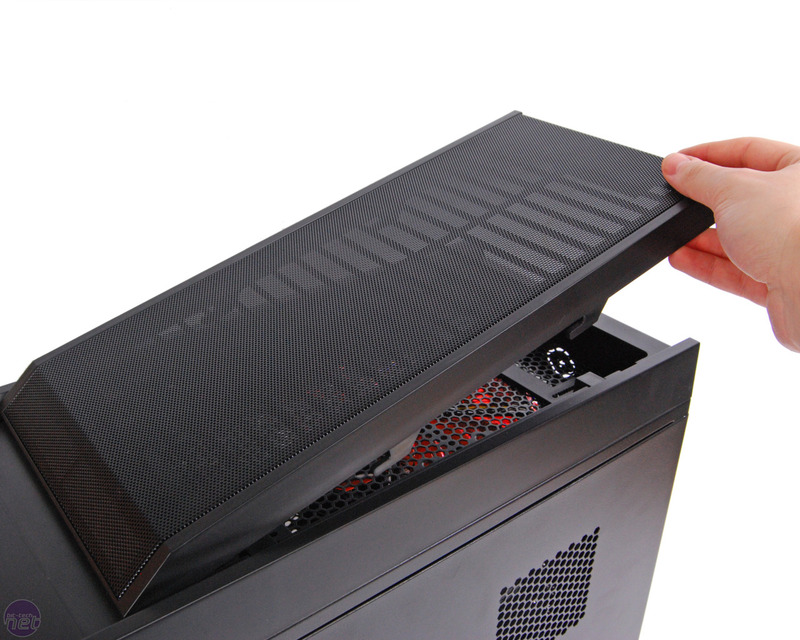 You could always mount the fans in the roof, with the radiator in the main chamber of the case, if did want a chunky radiator for your build. However, while we were offering up one of our radiators to the Utgard, we noticed something we nearly couldn't believe.The fan spacing on nearly all radiators now is 15mm, but the spacing between the two fan mounts of the Utgard is 20mm. Unfortunately, this means that some modding will be required for things to fit. This is a very silly oversight on Xigmatek's part and while things could be rectified in 15 minutes of drilling, it's still a fly in the ointment. We mentioned this issue to Xigmatek and it says that it's working on a slightly revised version of the Utgard that'll be on sale in a few months. Xigmatek said that if it was able to shorten the fan spacing to 15mm it would with this minor update. The confirmed revisions for the new version are minor - a dust guard for the bottom 140mm fan mount and rubber mounts for the drive module to name a couple - so if you're not bothered by the radiator mount issue, there's no desperate need to wait for the update. In the gap in the roof for the radiator is a strategically placed slot for the barbs or tubing at one end, and two pairs of tube routeing holes at the rear of the case. In addition to cable routeing clips, a 3.5in to 5.25in bay adapter and various mounting screws, the Utgard also comes with rubber grommets for the tube routeing holes. Cable routeing is made relatively easy thanks to strategically cut holes in the motherboard tray, which has also had the CPU area cut out so you won't have to remove the motherboard to change the cooler or waterblock. For some reason, the hole at the top of the motherboard tray proved nearly too small to fit our 8-pin EPS12V cable through. However after a few minutes of fiddling the connector popped through and the rest was straightforward. 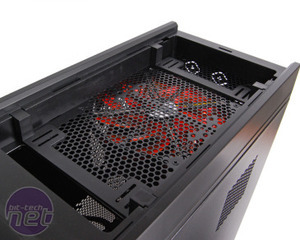 The PSU can be mounted with a bottom-mounted fan pointing upwards or downwards, and there's an easily removable dust filter in place in the floor if you go for the latter.